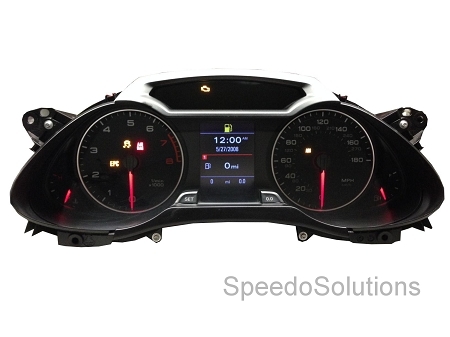 2009+ Audi B8 A4/A5/Q5 Instrument Cluster + Coding Service allowing replacement of faulty existing cluster or upgrade of the "red" display cluster to the Color TFT LCD Instrument Cluster (available on MMI Navigation equipped cars). Service includes coding of Component Protection (anti-theft) feature incorporated into many modules within current Audi vehicles to prevent exchange of 2nd hand components between vehicles. Service also covers matching of the current odometer state and other coding. Package includes donor Color TFT LCD cluster as well as Coding / Cloning Service for Plug and Play operation. Process requires shipping of your existing instrument cluster in for a snapshot / capture of current configuration. Once captured, the information is then cloned onto the donor instrument cluster and returned for plug and play operation. Please contact us regarding for details when purchasing this service.